Minotaur IV Pathfinder on Launch Pad at Vandenberg Air Force Base, Calif.
A team of industrial and military engineers have designed afix to the issue grounding the new Minotaur 4 rocket, but an $800 million spacetracking satellite waiting for launch could be shuffled behind other payloadsin the Air Force manifest. The Minotaur 4 has at leasteight missions on the books, but the vehicle's maiden flight has faced severaldelays stemming from problems with satellites and rocket issues. The latest issue concerns the rocket's third stage, a solid-fueledmotor taken from the military's stockpile of Peacekeeper missiles.Furnished by the government, the third stage's thrust vector control steeringsystem exhaust produces "unintended thrust which would cause issues inflight," according to a spokesperson at the Air Force Space and MissileSystems Center. Engineers from ATK, Orbital Sciences Corp., Northrop GrummanCorp., and the Air Force Space Development and Test Wing are developing adiffuser to attach to the third stage and disperse the exhaust, the Air Forcesaid. "This will decrease the unintended thrust and mitigateany issues in flight," an Air Force spokesperson said. 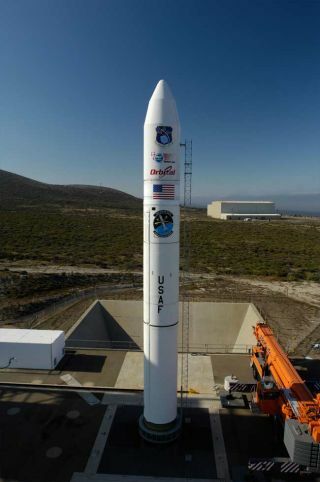 The issue affects all Minotaur 4 vehicles, but the Air Forcemay revamp the rocket's manifest and delay launchof the first Space Based Space Surveillance satellite until the third quarterof this year. Space News, a space industry media outlet, reported the SBSSlaunch could be delayed until December. The first Minotaur 4 mission may now fly from Kodiak Island,Alaska, with a cache of small military, NASA and university satellites managedby the Air Force's Space Test Program. That launch is still officiallyscheduled for May 28. In such a schedule, SBSS would launch on the second Minotaur4 rocket from Vandenberg Air Force Base, Calif. The Pentagon's TacSat 4 technology demonstration satelliteis also awaiting a ride to orbit on the Minotaur 4 rocket. An SMC spokesperson said the launch manifest scenarios arestill being finalized. Boeing manages the SBSS contract for the Air Force, and BallAerospace built the spacecraft. Pickard said the satellite is being kept in a launch-readystate while waiting for its rocket to become available. Workers have alreadycompleted construction and testing of the spacecraft. The satellite will join an array of ground-based radars totrack thousands of objects in space for the military.